Japanese Beetles are small but mighty, devouring all the leafy greens in your garden this time of year. Skeletonized leaves (only have veins remaining) are a sure sign that your garden has been feeding the appetites of these unwanted guests. The tricky part about treating them is that they are so invasive- just when you may have won the battle in your own backyard, your neighbor’s beetles will invite themselves over. Apart from that, they feed in large groups and are not particularly picky (although they do tend to be attracted to burgundy colored leaves), and cause severe damage. They’re making their way across the continent, devouring over 200 plant species with a special interest in roses. There is no magic recipe for a Japanese Beetle-free backyard. However, a little strategy will go a long way in protecting your garden! Perhaps the best procedure to prevent a Japanese Beetle invasion is Milky Spore Powder. Once it is applied (effective July-Sept) the white grubs under your yard ingest it and their internal fluids become milky white and they die, returning the bacterial spore back to your lawn. Milky spore is completely safe to use around wildlife, pets, and people and will last for 20 years! While it is the best method, it is the most difficult to apply and is more of a preventative measure- it only effects white grubs, not the mature beetles flying around your yard, and takes a few years to become fully effective (to get ahead of the game, we do carry Milky Spore here at Musselman!). For those adult beetles that are flying around, there are a few methods to get them under control. While beetle traps do catch massive amounts of beetles, they attract even more. If you choose to control your beetle population with traps, be sure to place them far from their plant of choice in your garden. Insecticides are always another option to treating these destructive organisms. When using insecticides, be sure to apply them in the evening hours of daylight, after the pollinating insects and other beneficial organisms in your garden have ceased activity. Insecticidal soaps will kill your beetles, but won’t offer any ongoing protection to your plants. Musselman carries Sevin and Bonide Eight Insecticides. Eight won’t just defend your garden against Japanese Beetles, but every insect on your plants and around your home and the protection lasts about 30 days. When considering an insecticide treatment, be sure to read the product label to determine which treatment will solve your specific beetle problem. While other methods attack Japanese beetles at different stages in their lifecycle, Spinosad treatments work on all life stages. It affects the nervous system of the insects it comes in contact with and initiates their paralysis and death in 1-2 days. Once spinosad spray has dried, it has little to no effect on honeybees or other beneficial insects. In addition to your weapon of choice- pick a few or a few hundred clumsy beetles off your plants by hand! They can easily be picked or dislodged, and shaking them off the leaves of your plants into a bucket of soapy water early in the morning can be particularly productive. Oddly enough, Japanese Beetles breathe through their backs, and even spraying them with soapy water will suffocate them. 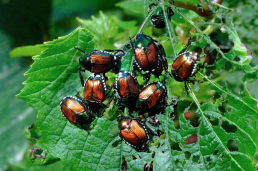 Planning to join the fight against Japanese Beetles? Stop in to see us with any questions and we will be happy to discuss the products we have available- get them at Musselman and your garden will thank you! Photo from The Associated Press.